Once you have selected the type of natural stone and color for your latest project, you will need to choose the finish. Several natural stone finishes are offered, but honed and polished are among the most popular finishes for countertops, bathroom vanity tops, and fireplace surrounds. Marble.com offers an extensive selection of granite, marble, and many other types of natural stone in honed and polished finishes. The finish of the natural stone influences the look and feel of the room. Many homeowners choose a specific finish to create a particular atmosphere. Polished finishes have a sophisticated appearance that invokes a feeling of luxury in the space. Honed surfaces have a softer look that creates a more casual and laid-back mood while retaining the elegance and beauty of the natural stone. This Ubatuba granite countertop has a polished finish. You can tell by the shiny surface area. There are advantages and disadvantages to both honed and polished finishes. The decision is often based on personal preferences and the interior design style of your home. 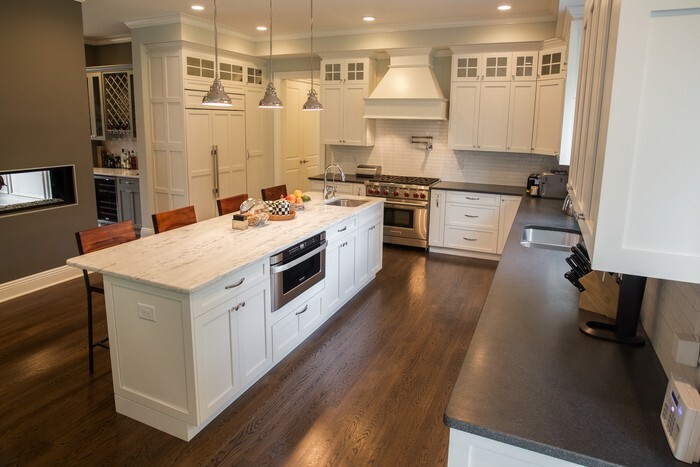 The architectural features of the home, flooring, cabinetry, furnishing, and décor can influence the choice between honed and polished granite or marble for kitchen countertops, bathroom vanity tops, or fireplace surrounds. Natural stone with a honed finish has a smooth, flat, and unpolished appearance to the surface of the stone. There is a very little reflection of light on the stone’s surface. The stone appears porous and has a natural-looking matte finish. Generally, the stone colors seem lighter, compared to the same stone with a polished finish. Some types of stone have a naturally unpolished look, while others have more of a natural shine, even before the finishing process begins. For example, granite and marble have more shine than travertine. And slate has an already has a honed look and feel to it. During the finishing process, the stone is ground to the smooth and flat finish. As a result of this process, the surface of the stone is satiny to the touch. Abrasive polishing pads are used to remove small bits of stone to create the matte finish on the surface. This polishing process also lightens the color of the stone while creating a smooth looking and feeling surface that is not glossy. There are advantages and disadvantages to this finish. 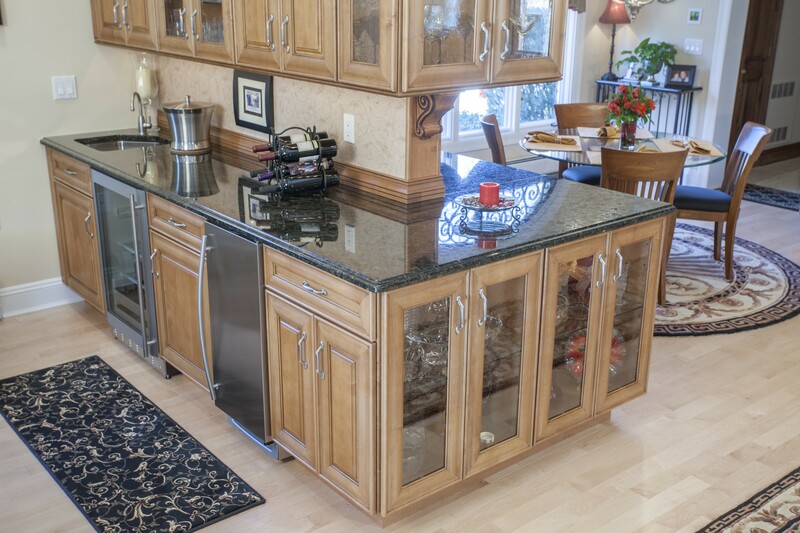 Honed marble and granite are more porous than a polished finish, which means it will absorb spilled liquids easier. If you choose honed countertops or bathroom vanity tops, you must be diligent about wiping up spills. On the other hand, scratches are not as obvious, as the stone is not as reflective when the light hits the surface. Polished natural stone has a shiny and reflective surface. Polished granite countertops or even a lovely polished Calacatta Gold marble fireplace surround provides a high-end appearance that infuses beauty and luxury into home design. The full color and depth of the crystal structure within the stone and vibrancy of stone colors are more readily seen with a polished finish. The initial process for polished stone is the same process used to create a honed finish. The stone is first honed with abrasive pads before being polished to a high gloss. To create the shiny surface, the stone is polished again with finer polishing pads to bring out the glossy, reflective polished finish. The result is a smooth texture that is not as porous as honed. However, spills still need to be wiped up quickly on some types of natural stone, such as marble, to make it less prone to staining or etching the surface. The natural stone industry offers several finish options. However, every finish is not available for all types of stone. When you shop for a particular type of stone, you will be advised about the finish options that are available for that stone. There are several factors that you may want to consider when selecting both the type of stone and finish for your bathroom vanity top, kitchen countertops, backsplash, or fireplace surround. One important factor to consider is where it will be used. Are you looking for new countertops for a high-traffic kitchen, a fireplace surround, or bathroom vanity top? The application can dictate the best type of stone. For example, you may choose a honed Calacatta Gold marble fireplace surround to create an elegant focal point in the living room and you can choose polished granite countertops in your kitchen to make spills easier to clean up. Consider the interior design style of your home. Although all types of natural stone can be used with most interior design styles, the specific stone colors and finishes that work best vary, depending on the style of your home. What type of atmosphere do you want to create in the room? Do you want a formal living room and dining area that will create an impression of luxury and elegance? Are you trying to create a more relaxed, casual, or tranquil space? Honed works well for creating a casual and homey atmosphere, while polished has a more formal appearance. There are always variations in color and pattern, so your new Black Pearl granite or Fantasy Brown quartzite countertops may vary slightly from the photograph or sample you may see when you purchase your natural stone. Whenever possible, it is a good idea to visit the slab yard in person to find the perfect stone for your marble, granite, or quartzite countertops. Honed and polished are among the most popular finishes used in kitchen countertops, bathroom vanity tops, shower surrounds, and fireplace surrounds. There are advantages and disadvantages to each type of finish. Consider the interior design style of your home, where the stone will be used, and your own personal preferences to select the perfect finish for your project.